Biggest advantage of being in Niche is that one have no competition and hence one can command price. This delivers higher profit margin and unique identity with less work. You become specialist of what you do. However, being in mainstream you will have to be competitive with hundreds of other business. You will need more number of jobs to earn same money. Means you will have more work, more people and more overheads but less profit margins. So in other words, you may have to work harder to earn same money. You will get diverted from you core niche business and if same continues, you may lose niche position you have created for yourself. 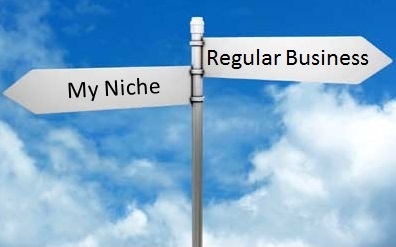 My advice, focus on your niche segment. Anyways you are fresh in business and hence you have a long way to go before you hit a saturation point. When everyone walking north, walking towards south is not everyone cup of tea, people with strong faith and beliefs can do so and often discover new world/ horizon. So if you strongly feel that niche which you have created has enough potential for your to harvest… than keep walking south. What would happen if somebody started a niche company but soon after starting, the company begins to get ‘general business’ / ‘mainstream business’? What should the company do?